It’s time to start my garden! This will be my 5th year at gardening in Colorado. It’s quite challenging but I still think it’s fun. I’ve learned a few things along the way so hopefully this year will be great! I don’t like those little peat pods that you can use to start your seeds. For one thing, they cost money. Not a lot of money, but still. I want to grow my garden for as cheap as possible. Also, they are small. When the seedlings start to get big, they get too crowded and don’t grow properly. So this year I’ve taken the advice of the internet and started them in leftover plastic containers. My only problem was how to make holes in the bottoms! A screwdriver didn’t work, a knife didn’t, scissors didn’t. A drill probably would have worked but I opted to use a Dremmel tool which worked perfectly. I got some seed starting mix and used seeds leftover from years past. 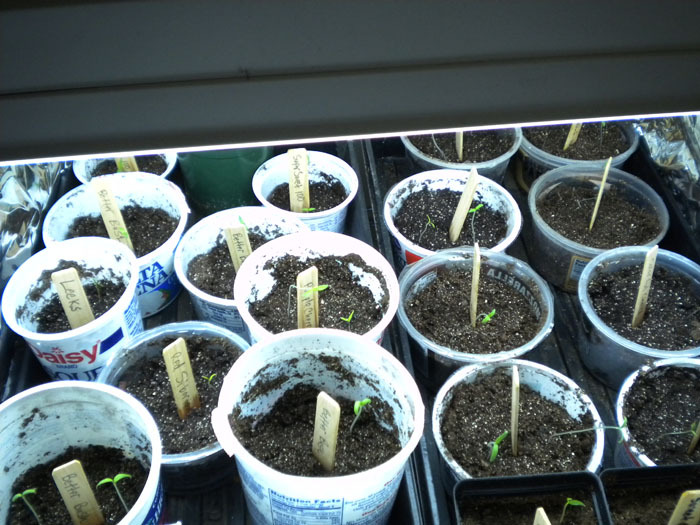 I started with peppers, tomatoes and leeks on March 3rd, then added some herbs and zucchini on March 22nd. 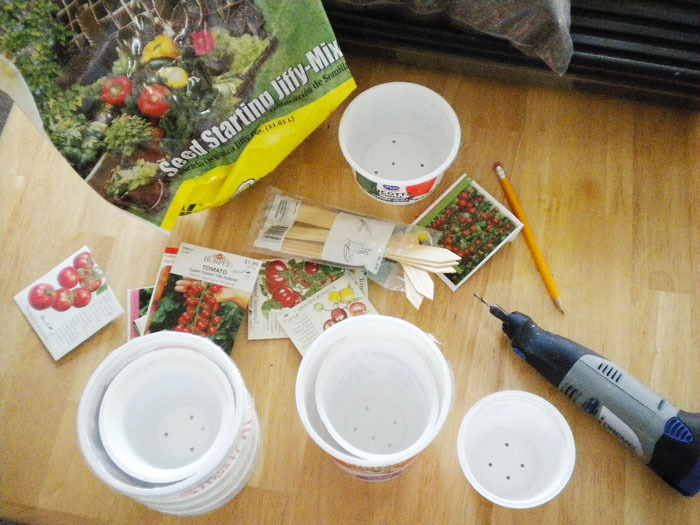 This year I'm starting my seeds in plastic yogurt and cottage cheese containers. Last year I had a huge shelving unit with a bunch of lights. I didn’t go that far this year. I started the seeds later so they won’t get as big (before planting outside) and won’t need as much space. I started them with reused plastic bags over them in the dark. As soon as they sprouted I put them under the lights. Just regular shop lights from Home Depot.The aluminum foil helps to reflect the light and also warm the plants. 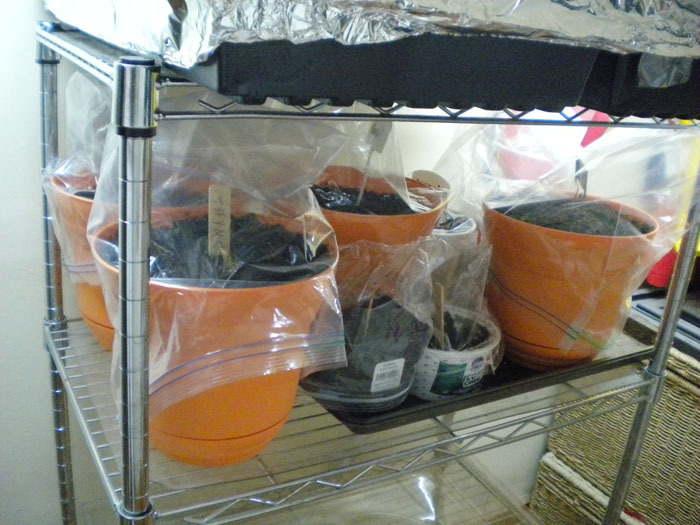 I put the plastic containers into trays so I can fill the trays and water the seedlings from the bottom, so as not to disturb them from above. I had some plastic trays from last year, but cookie trays with sides also work. 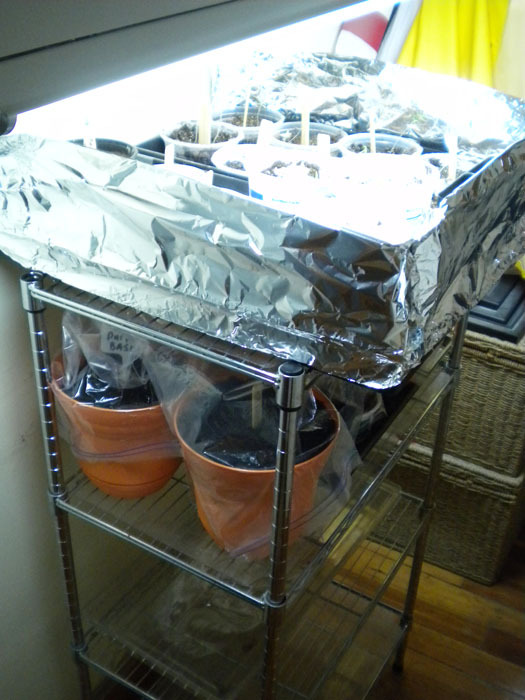 The lower shelf is good for seeds that haven't yet sprouted. They need to stay in the dark. I grow everything in big buckets, not in the ground.